One less layer of stuff on the face sounds like a good idea, so base products that also offer a high SPF are always welcome in my world. What we usually get is a foundation or a tinted moisturizer that also offer a good SPF, though I don't always trust them to provide all my sun protection needs and also use an SPF 30 day cream/moisturizer. That's why I was thrilled to receive La Roche Posay Anthelios 50 Daily Anti-Aging Primer with Sunscreen. SPF 50 is a good number, and a primer is something that you know will stay on your skin and hold on for dear life. La Roche Posay - Anthelios 50 Daily Anti-Aging Primer with Sunscreen is a thick silicone primer that's more of a paste than a liquid. The texture can be an issue if you have a strong preference for lighter products, but I'm willing to do just about anything to have massive sun protection AND ensure that my makeup stays put even on the most hot and humid days. It takes about a pea-and-a-half size amount of product to fully cover the face and neck, and about 45 seconds to fully work it into the skin. Anthelios 50 needs to absorb into the skin, not sit over it, otherwise you're most likely to clump and form little balls when you apply foundation over it. It's not a slap and go product, for sure, but I do think it's worth taking the time. Another tip is to make sure that whatever you use underneath La Roche Posay Anthelios 50 has fully absorbed before you proceed, otherwise it feels (and looks) like the primer is floating over your day cream. I also find that some foundations do not take kindly to this primer-- mostly non-silicone creamy ones. The tinted moisturizers I've tried (NARS, Laura Mercier, Smashbox) work well, and I've had no issue using Edward Bess and Serge Lutens compact foundations over it. I just make sure each layer has set before applying the next product. The result, priming-wise seems on par with any other heavy duty makeup base I have. Whatever base coverage I apply stays put as do color products. I'm not very outdoorsy, as you may have noticed, but I've been spending quite a bit of time lately in antique and flea markets, which added up to quite a bit of time in the sun. I do all I can to be careful: hats, scarves, sunglasses, but sunscreen is still the number one protection item, and I've been happy to see that La Roche Posay Anthelios 50 performs well. I'd recommend reinforcement throughout the day in the form of a mineral powder, but I admit forgetting to do that on more than one occasion, at least until I was back in the car. As far as I can tell the sunscreen held it own (and I'm one to get a tan from merely opening the window). Since we're speaking of La Roche Posay and their Anthelios line, they will be holding an upcoming event, Parasols Of Protection, in Madison Square Park on June 21st and 22nd from 11am to 7pm. Parasols Of Protection is a public event where you'll be able to get a free skin check from a board-certified dermatologist, and receive a free sample of La Roche-Posay Anthelios sunscreen. Products will be sold at the event and proceeds will go to skin cancer research. It sounds worthy to drop by if you're in Manhattan that day. La Roche Posay - Anthelios 50 Daily Anti-Aging Primer with Sunscreen ($39.90) is available from Ulta, select drugstores that stock La Roche Posay products (CVS in my area), soap.com and laroche-posay.us. The product for this review was sent sent to me free of charge by PR. Thank you! I ordered some on Amazon.com! Since no one in their right mind is going to slather their face with that much foundation or BB/CC cream (a typical squirt from a bottle is less than 1/16 teaspoon), a dedicated sunscreen needs to be worn underneath. Think of the SPF in foundations as a bonus and rely on a cosmetically elegant facial sunscreen of SPF 30-50 for your actual sun protection. Eileen, I have the feeling that a great many people don't get the sun protection they think they do. From using expired products that lost their effectiveness to not using enough and not touching up. I wish someone would come out with a kit that dispenses the right amount of sunscreen automatically. That Parasols of Prevention event sounds great - I hope they do one in DC, too. 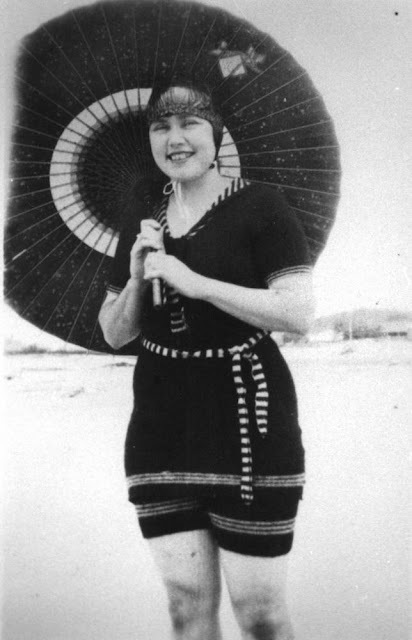 It would be wonderful if parasols were back in style!